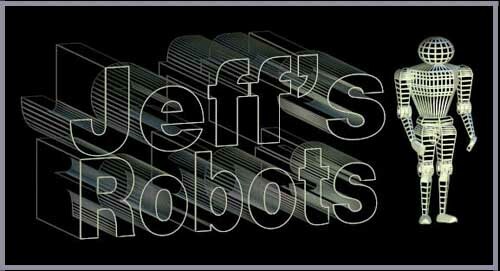 Jeff's Robots- toy robots & tons of robotics links! ROBOT : from the Czech and Russian word robota, meaning compulsory labors. Thank you for visiting my site, be sure to sign the guest book I just added. I will be adding more robots from time to time. I have never been a professional robot collector. My collection is extremely diverse. It is a mix of boxed and unboxed items, used and new, plastic and metal, powered and unpowered, computerized and analog. The underlying thread that binds them all together is that I value them all. They define at least a part of me, as well as those that enjoy this site. Relax, and let yourself lapse into a time perhaps long ago, when space was the exciting unknown, and robots were both friend and foe alike. Enjoy your visit! Q: What is a chatterbot? 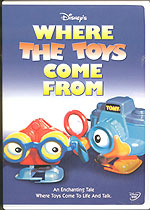 Jeff's Robots and Jeffbots copyright 1997.